Is this possible in PCS? I cannot figure out how the mounts were made at an angle. Yes I think so - do it sideways - put to the whole shape to the bottom and then fold to the back. 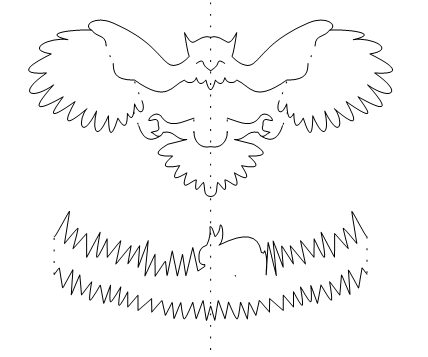 For the owl - you will have to split up the body and then add the wing parts on a plain away from the bottom and back - you might have to flip to the other side trick if the shapes conflict - Bryan's demonstration with the clouds comes to mind. It depends how much effort you want to put into it. It does have spikey grass though. 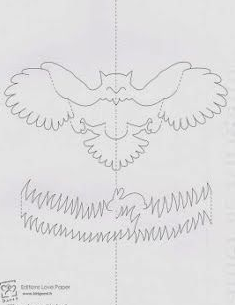 I'd set that up on a flat card and delete the outer edges of two feathers on left and right and make sure the bottom one lined up with that edge. Cut along top line and bottom line fold the two pieces in the opposite direction to the card. Would do it all in MTC as I see no need to use pcs. Place a second card behind to hide the holes and to give some further interest. Love that owl. 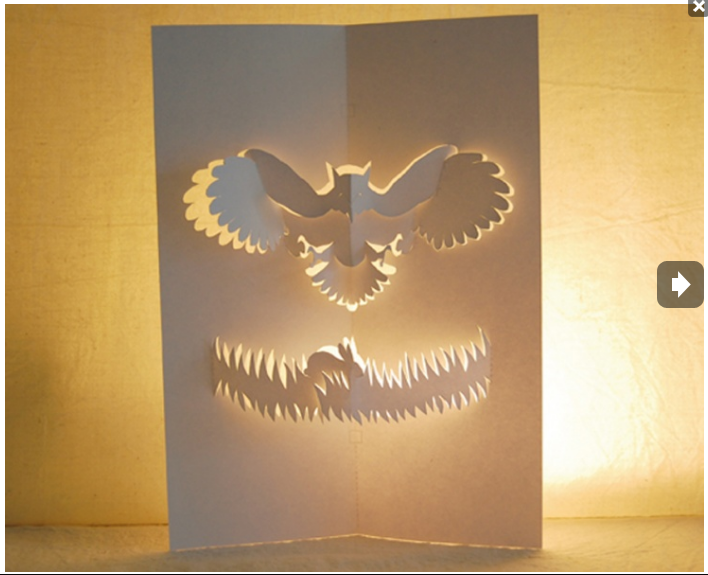 Another possibility is to cut them separate from the card, and fold zig zag and then attach to the centre of the card. Paul you are missing some cut lines in the spikey grass under the rabbit. I agree less pain to dio this directly in MTC. Andy reversed engineered the shapes into PCS for the dragon - so maybe that would be easier if Bev wanted to close the shape to put it into pcs. 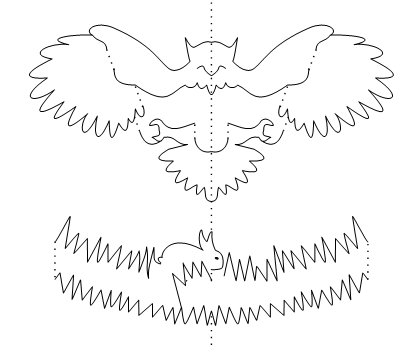 Can't do angles directly - you are right - but maybe you can trick the program - maybe with a hinge. It is so much easier to do this in MTC. Oh thank you my friends AGAIN! I did have this done in MTC but gave it up as I thought it would never cut....didn't even understand what I was looking at. I don't understand the part about these kinds of cards being designed to cut on the back but maybe I will when I try to cut this. Thanks @Crazy_Mr_Zing for making the file. I also need to go look at the PCS dragon. So now I need to look at all files in a different way...not all popups need PCS. Another mind-opener. I've not found the dragon popup yet? http://forum.make-the-cut.com/discussion/36750/hand-tracing-node-editing-mtc-and-pcs-a-time-lapse The Chinese dragon was done in a demonstration that Andy did - I think he even put it to music. Andy showed how he took a template - like Bev's, scanned it into MTC, closed the shapes in MTC and then transferred the shapes into pcs - sort of reverse engineering the pop up. I do not tend to work that way - I just take a picture - guess at the placement and draw it directly into MTC. I don't get it exact like I would if I scanned in a template and did it Andy's way. @leslie6111 The way you described how Andy did his dragon is exactly how I started but I guess I didn't go far enough. I got discouraged when I couldn't get the wings to angle the way I wanted them to. Now I'm thinking I just need to make the wings LOOK angled, then weld a rectangle to the piece I want to fold and crop that. But still that isn't going to make the look I want....think I will try it in MTC first. or was it a castle ? -Discard one side of the design .